The DC-10 was operating as UTA Flight 772 on the Brazzaville-N'Djamena-Paris route. The aircraft took off from N'Djamena at 13:13 and climbed to a cruising altitude of FL350. At 13:59 an explosion on board caused the aircraft to crash into the desert. The explosive device was located at location 13R in the cargo hold. The device was most probably hidden in baggage, placed aboard at Brazzaville. Possible groups responsible for the explosion are the Islamic Jihad group (demanding the freedom of a Shi'ite Muslim in Israel) or the Secret Chadian Resistance. 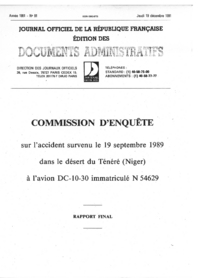 Co-incidental on March 10, 1984 another UTA aircraft was destroyed when a bomb exploded; in this case the bomb exploded during embarkation at N'Djamena. - DC-10 flight UTA 772, Brazzaville N'Djamena - Paris, was destroyed by an explosion on 19 September 1989, forty-six minutes after take-off from N'Djamena, while cruising at flight level 350 in totally normal conditions. - That destruction was due to an explosive charge placed in a container in location 13-R in the forward cargo hold. - The Investigation Commission assert that the most plausible hypothesis is that the explosive charge was inside baggage loaded at Brazzaville Airport. 1. The investigation commission recommend that the resolution A-27-9 by ICAO general assembly (about acts of unlawful interference aimed at the destruction of civil aircraft in flight) be put in force actively and firmly by all states. 2. The investigation commission recommend that security requirements and objectives be taken into consideration and be stated as having high priority when designing or enlarging a terminal used for international flights. 3. The investigation commission recommend that, at any transit stop, the airline at arrival systematically count passengers who disembark and then, before departure, count all passengers on board (transit passengers together with newly embarked passengers) . 4. The investigation commission recommend that an emergency location beacon be mandatory on board public transport aircraft that overfly inhospitable areas regularly and recommend periodic search and rescue exercises between neighbouring FIR centers to check the communication equipment amid procedures that make it possible to activate the emergency phases. Distance from N'Djamena Airport to Paris-Charles de Gaulle Airport as the crow flies is 4236 km (2648 miles).